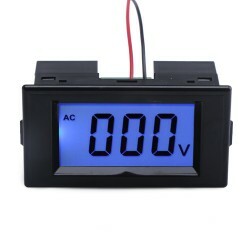 Feature: Dimensions: 48 x 29 x 27 mm Cutting Size: 46 x 27mm Measuring ..
the AC 60-500V Voltmeter, very suitable for measuring 110V/220VAC home/factory/garden power supply. .. It is a AC 80-500V Digital LCD Voltmeter,Accuracy: 0.5% ± 2 digits,Usage: Widely used in voltage reg.. It is Lcd Display Digital Voltmeter, AC Voltage Monitor/Tester, Measuring Range: AC 0~199.9V, Power .. It is Lcd Display Digital Voltmeter, AC Voltage Monitor/Tester, Measuring Range: AC 0~600V, Power Su..